The TEDC publishes very popular booklet listing all of the local businesses. We are in the process of updating that booklet now, and need your input. If you haven't yet provided your business listing, please get your info to us asap, as we plan to go to print on April 30th. 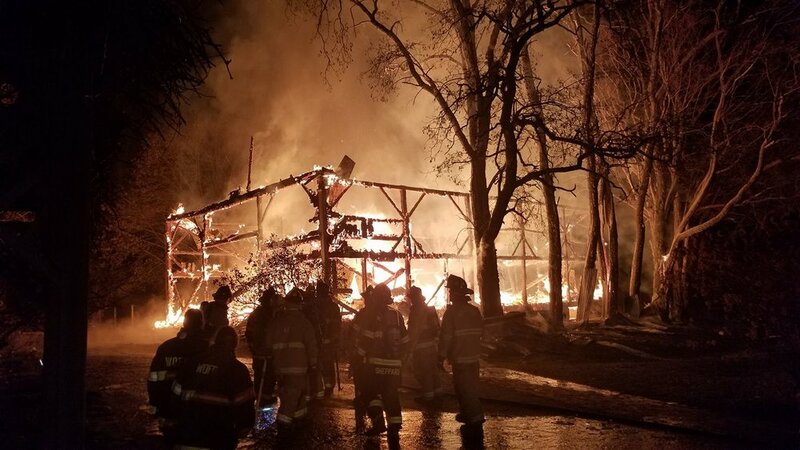 On Sunday night we were awakened to the horrible news that our wonderful barn was on fire. Rushing to the frightening scene, we saw the huge flames lighting the sky as firemen tried to save this lovely building, the site of so many happy occasions over so many years. It was soon realized that saving it was impossible so successful efforts to prevent the destruction of the Inn across the driveway began in earnest. At the end, after the total collapse of the barn and the destruction of the beautiful trees surrounding it, all we felt was devastation and despair. Within hours, however, our hearts began to be uplifted from the outpouring of concern and support from family, friends, brides whose weddings had been here, and the townspeople of Tamworth, some of whom we had never met. So many expressed their sadness and shared their memories of the special moments in their lives that had happened here. Tears flowed but resolve began to grow as the hours passed and we knew we had to accomplish a miracle and somehow rebuild our very special barn. Alternate venues and lodging for our pending events were of great concern, and many generous offers came forth in the ensuing hours. We thank you all for reaching out to us and giving us such love and reassurance at such a difficult time. Much gratitude goes out to the more than 40 firemen from area towns who worked so hard to control this horrible fire, and special thanks to Tamworth Fire Chief Richard Colcord and Fire Captain Matt Baumann. We have asked the Tamworth Economic Development Commission to be our liaison with the community so as to keep you all informed of our plans and progress as we begin to recreate our wonderful Barn here at the Preserve at Chocorua. They are forming a plan to invite the whole community to help with the restoration. Please contact Pat at patfarley26@gmail.com for further information. Welcome to the new Tamworth Economic Development Website. Here you'll find all the latest info on what we're doing, and details on our special events. From time to time, we'll have blog postings from local business people, sharing their ideas and knowledge with you. Keep in touch and get involved. If you have a skill or some ideas you'd like to share with other business people and entrepreneurs in town, contact us via email or the form found here on the "get involved" tab. On June 27, 2016, The Tamworth Economic Development Commission, was recognized by the Lakes Region Planning Commission with an Award of Excellence for their New Career Day.. The Commission was represented at the awards ceremony, by Pat Farley, (Secretary of the LRPC), Lloyd Hadden and Kimball Packard, New Career Day was held at the Town House in May, and provided an opportunity for people to explore new careers with area businesses who had training/internship positions to offer. The Career Day was well attended, and a number of people were placed in jobs that have become permanent positions.